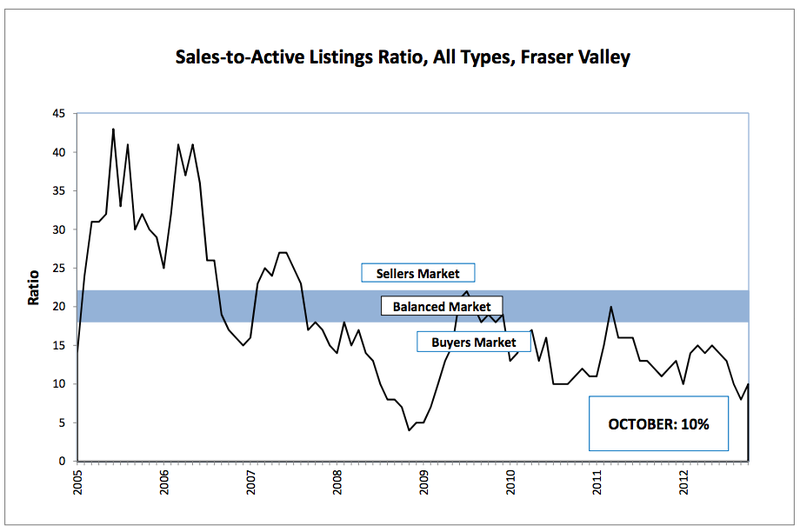 The Fraser Valley Real Estate Board (FVREB) processed 1,053 sales on its Multiple Listing Service® (MLS®) in October, a decrease of 8 per cent compared to the 1,139 sales during October last year however a 23 per cent increase compared to September. Scott Olson is the president of the board. “This is a marked improvement over September. Our sales increased at the same time as our inventory dropped improving our supply-demand conditions. The number of new listings posted on the MLS® in October was on par with the same month last year and a decrease of 1 per cent compared to September with the result that the volume of active listings in Fraser Valley at the end of October remained unchanged compared to 2011 and 3 per cent fewer than in September. Benchmark prices for residential property types are showing month-over-month decreases however, depending on the property type, still show positive gains year-over-year. The benchmark price of a detached home in the Fraser Valley in October was $546,900, an increase of 2.5 per cent compared to October 2011, when it was $533,800; and a 0.5 per cent decrease compared to September when it was $549,500. The benchmark price of townhouses decreased 2.2 per cent going from $303,900 in October 2011 to $297,100 last month. The benchmark price of apartments increased year-over-year by 2.9 per cent, going from $198,100 in October of last year to $203,900 in October 2012. “Over the last three months we’ve seen the impact of lower sales and higher selection on prices of typical homes in our region. In most communities and for most property types, prices have slowly decreased in small increments month-over-month. Economists at the British Columbia Real Estate Association have predicted sales in the Fraser Valley will rebound by 6 per cent in 2013 compared to 2012 while prices will remain flat.